The SPL series is a self-contained solar LED area light that is an ideal choice for pedestrian and commercial applications. A compact and functional design allows the SPL series to seamlessly fit into any setting. 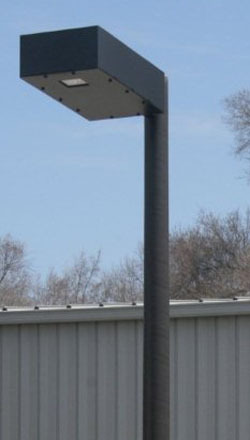 Using quality American-made components the SPL series is an excellent off grid lighting solution. The newly available SPL: High Power is ideal for situations you need everything above with nearly double the light. The performance of the SPL series is maximized with the use of a proprietary Light Control System (LCS). The LCS adapts to the SPLs current battery state of charge and automatically adjusts the LED lights accordingly to ensure optimized performance. – All lighting profiles are tailored to fit client needs.